If your horse frequently controls you (instead of the other way around), if you've reached a training plateau, or you're starting a colt or training a true performance horse, then this article is for you. Training your young horse requires just four things: motivation, spot, direction, reward. Here's how to get them. Training a horse is all about control. The trick is to take control of one body part at a time and to be an active, rather than reactive rider. Remember: You don't build a house in a day. You build it brick by brick. So give your horse-and yourself-time to digest the information that follows. Training a horse is pretty simple. It's four things: motivator, spot, direction, reward. That's all training a horse is. First, motivation. Do you have a job? What if I asked you to quit your job? What if I said I was going to hire you and give you two bucks an hour. Would you do it? Working with a horse is very similar. You're asking the horse to quit his job and come work for you. His job as you begin training is to get out of that arena as fast as he can, or to get back to that stall or to a buddy horse or find food. They have all kinds of jobs - and their jobs keep changing. Our job is to create a motivator that causes the horse to quit his job and come work for us. Quit trying to get out of the gate; quit trying to get to the other horse. Quit trying to pick up your left lead and come work for me. Some horses you can hire for two bucks an hour and some will cost you forty. That's just the way it happens. Some horses you really gotta motivate; you gotta say, "No, I really want you to come work for me." It's important that you understand that I'm not asking them to come work for me. I'm not thinking that they "want to" or they "should." They don't want to; I can promise you that. They'd much rather be left alone. So, I have to find a way to motivate them. The second thing I'll work with is a spot, a part of the horse. Not the whole horse, but a specific part of the horse. If I can control that particular body part, then all of a sudden the feet start to follow. The third part of training a horse is "direction." Where do I want the horse - or that part of the horse - to go? Each part of the horse can go six different directions: right, left, forward, backward, up and down. The fourth and final thing when training a horse is "reward." When the horse finally moves the correct direction, how do I say "Yes, that's what I want"? You have to keep horse training just that simple. What makes training hard is when you let everything else interfere, other people, other horses, noises, moving objects, etcetera. It gets hard when you let anything else take your attention away from training. Don't let that happen. 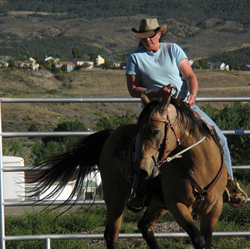 The trick is simply to stay focused and actively ride your horse. The moment you look up and look at another horse, you're riding that horse, not your own.